As a general rule and with a bit of lateral thinking speaker ranges could be considered like car ranges. You have your sub compact models (we call them bookshelf), compacts (small floor-standers), 4x4s (sub-woofers) and cabriolets (electrostatics) . I could go on but you get the general idea and for those of you who are wondering what I'm on about all will become clear in the next few lines. The Living Voice range looks at things a little differently and from a more simple perspective more appropriate to small volume high quality production. You've got the executive saloon range (as big as most garages can cope with) and the luxury hi performance limousine which you can't fit in the garage even if you could afford one (It's called the Vox Olympian in case you've been hiding in a cave in Mordor for the last 5 years or so). For this review we're concentrating on the executive saloon but as we shall see we're not talking Ford Mondeos (Taurus for our US readers) here. So why have I likened a range of speakers to a car range? Well it allows me to give you a feel of the philosophy behind the range and the differences between the models and their prices. As I said above we're steering clear of Ford and I think a comparison with the BMW 3 series is appropriate here. 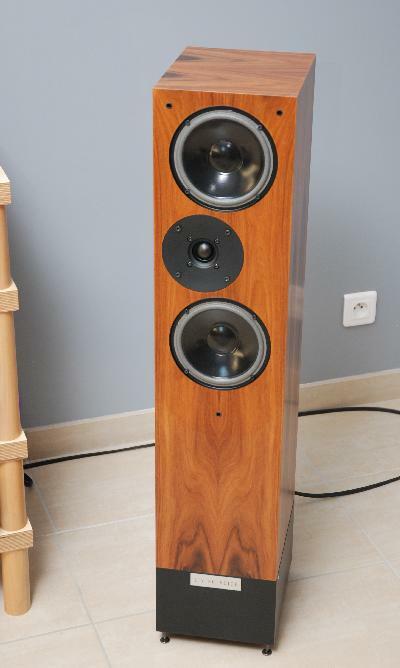 The Auditorium range consists of 4 models and they've been in production for over 20 years with the 3 indicating that they're the third generation of the model. All four share (and have always shared) the same size cabinet with a d'Appolito 2 way configuration, real wood veneered finishes, specific bases and selected components. The top two versions are also available with inboard or outboard crossovers. The BMW 3 series also consists of a range of models based on the same chassis which are visually pretty identical. In both cases the base models are serious bits of engineering and the upper models build on the basic DNA to produce superior results. The model tested here is the Auditorium Avatar IBX-RW3 (and no you can't use the name in Scrabble) which is the top model with the inboard crossover - hence IBX rather than OBX naming. The IBX idea came about when customers wanted to know of they could have all the upgrades of the original top of the range OBX model but with the crossover still inside the box. Whilst there is a slight loss in outright performance the installation takes up less space and doesn't require extra cabling making the IBX versions more domestically acceptable for those who don't have dedicated listening rooms. They're also slightly cheaper. So, to go back to car speak, what does this M3 version get you that you don't get on the 320i entry version? Compared to the "base" model Auditorium the RW3 gains an improved bespoke tweeter, better wiring harness, WBT platinum binding posts, upgraded crossover, better bracing on the cabinet, better component matching and some but not all the components are cryogenically treated via a very specific process. Virtually all this is hidden away inside the box further underlining the M3/320i comparison. But as we all know some stealth modifications can have enormous benefits to audio components so lets look at the RW3 more closely and see what it can do. The version I have here is in the 8295 GBP Santos Rosewood finish which is only available on certain models. The review set I have are supposedly cosmetic seconds but I've been looking for the faults for about 6 months now and can't find them so you can expect some pretty stunning finishes if you buy a new set. The veneer is matched from left to right and is frankly gorgeous (even though I'm a sucker for the slightly more expensive Burr Oak finish if I'm totally honest!). The cabinets stand around 4 feet (120cm) high on their bases and are fixed to them via (supplied!) Blu Tack. The bases are then spiked to the floor - floor protectors are provided for those of you who don't have carpet. The cabinets are specific left and right with the tweeter offset towards the inside to provide a more coherent sound field via improved time alignment. Grilles are provided to protect the drivers for those of you who have cats or children (or both). The result is a high (94dB) sensitivity design with an easy 6 ohm impedance that will happily work with low power valve units allowing you a huge choice of amplification whilst avoiding the necessity to shell out for hundreds of watts - quality rather than quantity being the watchword here. 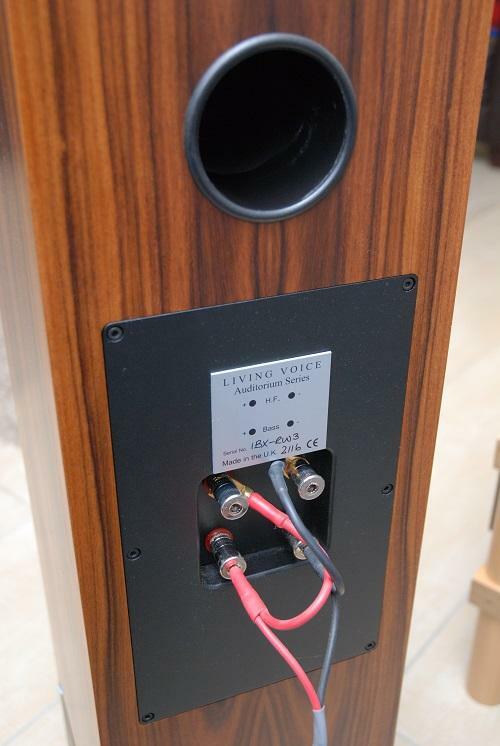 Regular readers will have observed that I run a Canary Audio CA608LV which is a 35 watt valve design. Before any of the more observant (and conspiracy theorists) among you cry foul here due to the LV suffix on the amp I'm going to take the opportunity to clear up a few things. Yes the amp is an LV version and had been improved by Living Voice before I bought it second hand 3 years ago. So there's no cheating or backhanding going on here - yes I may have a favourable setup for these speakers but as we'll see digging out my old faithful Mission Cyrus One was equally insightful into what these speakers are about. Installation of the RW3s is relatively simple - firstly there are some fairly simple to follow supplied instructions as to placement - around 45 cm from the rear wall and crossing over in front of the listener. This may look a bit weird compared with catalogue pictures as there's quite a bit of toe in but catalogues be damned (especially as no speaker in a catalogue will actually work due to the fact no one plugs cables in for the photos)as it sure works. The RW3s initially impress with their sense of scale and realism. Instruments and voices have presence and power. Bass has weight and just the right amount of warmth and top end is precise and present without ever being bright. Extended listening reveals more of their qualities and it's during this period that I realized just how talented they are. I mentioned bass scale and weight above - in addition you can add the ability to follow fast complex bass lines without missing a beat and all the time portraying the tonality and colour of the instruments. 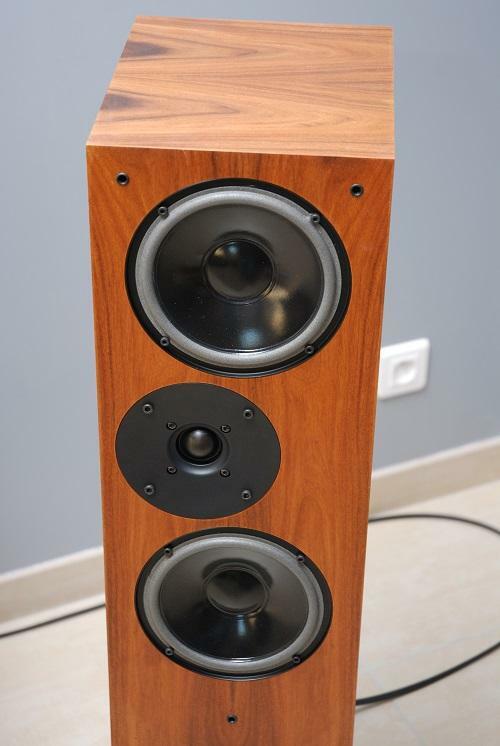 Dynamic swings are highly impressive - play something in the Canary CD300LV like the Minnesota Orchestra rendition of Saint SÄens "Danse Macabre" with Eiji Oue at the helm and the RW3s going from quiet to very loud in less time than it takes to drop a hat. Having run smaller speakers for many years it's quite a surprise the first time you hear it but a very pleasant one. The same recording also shows how well the RW3 can separate the instruments in a orchestra and place them into the sound field - the concept of bringing the orchestra into your living room and allowing you to experience your own private performance. While we're on the subject of scale the RW3s fare extremely well with the other end of the musical spectrum with drum and bass. Taking PFM's "For all of us" on vinyl the track starts with some percussion clearly placed in space in the sound field. This is then joined by some keyboard pads until the first bass notes appear. And appear they do - both from the speakers and through the sofa. When the drum loops start, again the RW3s show their speed and clarity but without becoming toppy or harsh. There's always a certain level of lushness in their performance but never at the expense of speed or the ability to follow a tune. In order to not leave out the rock side of things I dug out some classic albums to see how the RW3s would fare. As a guitar player myself I've often got hold of tablature for guitar parts and wondered if the transcriber was having a laugh and being a bit creative with the score. Well with the RW3s it's a mystery no more. AC/DCs "You shook me all night long" had clearly defined guitar and bass parts showing that the transcriber was right all along! It's a simple tune but one that often becomes an amalgam of guitar and bass on some systems. The RW3s clearly differentiate between the two and show how incredibly tight the Young brothers rythmn guitars are almost (although not quite) eclipsing the guitar solo. Metallica's "Enter Sandman" was equally powerful and precise with the vocal doubling in parts of the track taking up wider space on the sound stage but without overpowering the instruments. Another (very useful to reviewers in particular) trait of the RW3s is their ability to differentiate between different components that they're connected to. Using Stevie Ray Vaughan's "Couldn't Stand the weather" I ran some back to back tests between my Naim CD5i and the Canary CD300LV (review to follow). 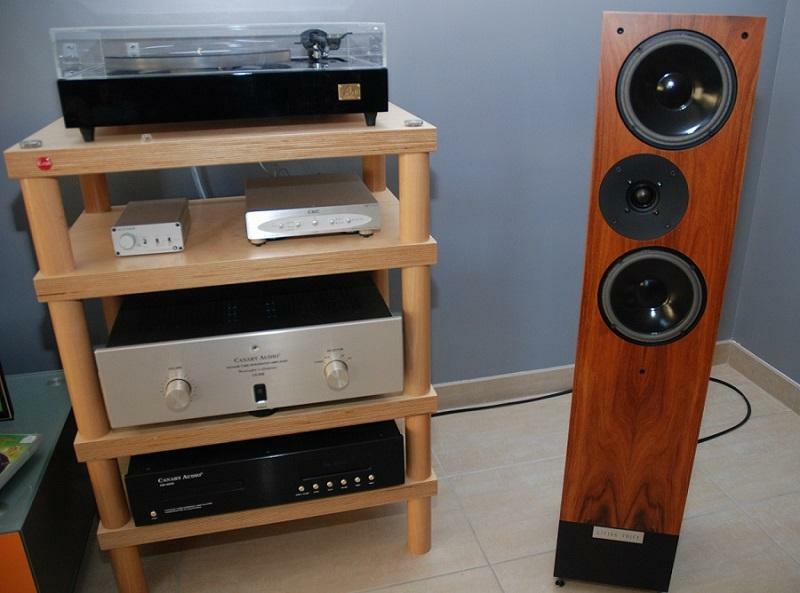 The Naim concentrates on the vocal and the rigid stop start nature of the music. The Canary on the other hand brings all the fine detail and tone of the instruments and has a wonderfully refreshing musical flow. It just sounds more like music making the Naim sound mechanical in comparison. The difference between the two players is clearly obvious to the point that one of the listeners in the room at the time asked if it was the same recording such was the magnitude of the difference. While doing back to back CD tests I also dug out my old faithful Mission Cyrus 1 from 1991. Again the RW3s clearly show the differences - the Cyrus has a highly propulsive nature but loses out to the Canary 608LV on tone, detail, warmth and subtlety. But, and here's where the RW3s can score some more points - the results are revealing but not harsh. They aren't unkind to what would be a 500ish GBP amp if it existed in the same form today. I'm not going to recommend you buy this combination - the performance level of the Cyrus 1 along with it's character isn't ideal and I think a lesser model in the Living Voice range with a Sugden A21 or similar would likely be more satisfying in the long run. But it's not bad and shows that the RW3 can run quite happily with little amps - even inexpensive ones. There's one thing I haven't mentioned yet and I think it's one of the characteristics that make the RW3s very special and the best description I can give is insight. I've had some speakers at close to this price over the last year or so and none has been able to provide the same level of feel to vocals. Complex vocal arrangements remain complex but become easy to understand and more importantly to appreciate the talent of the singers. Guitar solos like Kirk Hammett's on the Metallica track mentioned above have a more human feel and are more than just a sequence of notes - the phrasing and the leaving of time for each line to start at just the right point are there for you to appreciate and understand the construction of the part. I think my earlier reference to BMWs is appropriate here - the Auditorium range is a talented one and having heard some of the models over the years they've always impressed.The RW3 model just ups the ante even further extracting even more performance from the concept. In the same way an M3 provides supercar level performance from an evolution of a simple concept so the RW3 brings high end performance from a traditional in concept speaker.They'll blend with any decor (especially now the piano black finish is available), have a pretty high WAF level which is further increased by the fact you're not going to have to buy a pair of enormous power amps to drive them. They will clearly show you what's going on with the system and the music and will keep showing differences - if an upgrade doesn't sound like one on these it probably isn't and you've wasted your hard earned! Above all they will have you hearing and most importantly enjoying your music better than ever before. They're like a breath of fresh air in the system and have had yours truly and vistors to Budd Towers transfixed and grinning in equal measures. What's not to like?